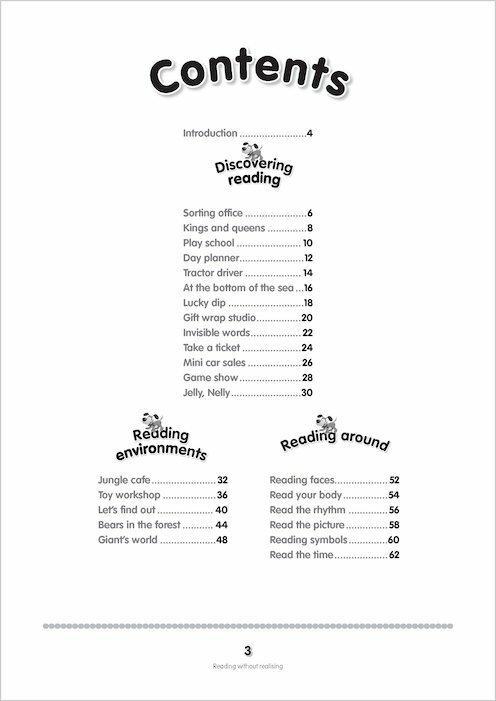 You don’t need a reading scheme to enjoy reading texts. 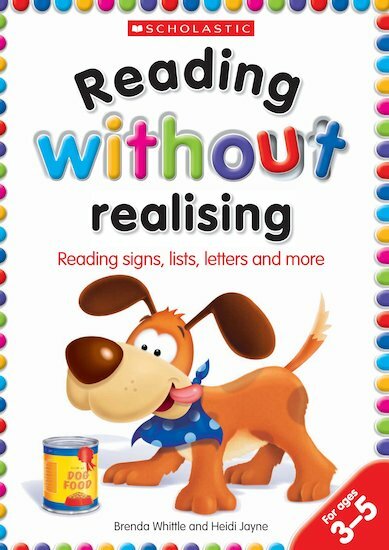 READING WITHOUT REALISING throws away traditional techniques and gets the children reading signs and texts around them. Brenda Whittle is a former primary head teacher and an educational writer. She runs art workshops in primary schools and early years settings. This book really appealed to me. I feel there is a real need for such a book. With so much pressure on getting children to read before they are ready, guidance is needed to help practitioners and parents see that many activities can support pre reading skills. Each activity is well set out with easy to read bullet points and I also like the extras- learning objectives, cross curricula links, home and play links, extension ideas and differentiation. I did find however that most of the activities were more suited to children in the later foundation stage- perhaps reception class children. There were a few activities that I was not so impressed with- for example the ‘Play school’ activity I felt was heading back towards more formal reading- especially with the home links. But, on the whole, I liked the activities and found there to be a good range covering a wide range of other curriculum areas too. One of my favourite activities was the tractor driver one which would be great for involving boys in reading. I also really liked the reading environment section and if I was working in a school would be keen to try out many of these ideas. They were not so appropriate for pack away settings though. On the whole a useful book with some good ideas and it makes me want to see other books in the series! Teacher Miss Karen Beresford looks at Early Years Bookshop: Reading Without Realising for us. This book really appealed to me. I feel there is a real need for such a book. With so much pressure on getting children to read before they are ready, guidance is needed to help practitioners and parents see that many activities can support pre reading skills. Each activity is well set out with easy to read bullet points and I also like the extras- learning objectives, cross curricula links, home and play links, extension ideas and differentiation. I did find however that most of the activities were more suited to children in the later foundation stage- perhaps reception class children. There were a few activities that I was not so impressed with- for example the ‘Play school’ activity I felt was heading back towards more formal reading- especially with the home links. But, on the whole, I liked the activities and found there to be a good range covering a wide range of other curriculum areas too. One of my favourite activities was the tractor driver one which would be great for involving boys in reading. I also really liked the reading environment section and if I was working in a school would be keen to try out many of these ideas. They were not so appropriate for pack away settings though. On the whole a useful book with some good ideas and it makes me want to see other books in the series!